Many use words - few actually do what the words say! - we are different! 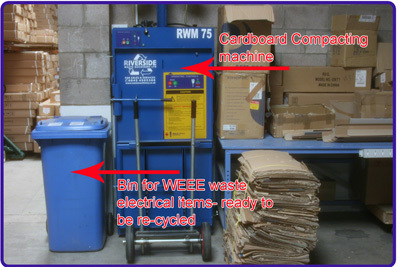 In addition our cardboard re-cycling and WEEE processing, all damaged metal parts are stripped down and sent for scrap. Very little of our waste goes into landfill. We actively go out of our way to find homes for surplus materials. Examples of this include a recent donation of long paper rolls to a local school. This was ideal for children to use in the art class to make banners. We have recently been awarded the coveted "Green Dragon" environmental award for our processes. Premier Group (UK) Ltd recognises a need to protect and improve the environment in which we work and serve, adopting wherever practicable the principles of sustainable development. We aim to progressively improve our practices in environmental management. We believe that such a commitment will deliver whole life cost benefits and new business opportunities for Premier Group (UK) Ltd.
· Consider the efficient use of energy, water and materials, the sustainable use of renewable resources and the reduction of adverse environmental impacts. · Contribute to the conservation and protection of the natural environment. · Promote environmental awareness among all our staff and encourage their involvement and suggestions. · Expect our partners, key suppliers and contractors to share our concern for the environment and to work with us in identifying and applying best practice. Ultimate responsibility for implementation of this policy rests with the Managing Director. We shall prepare annually a plan for the progressive improvement of environmental performance stating specific objectives for the year with associated quantifiable activity and performance targets. It will be signed-off by the Managing Director. Progress against the plan will be reported as part of the annual management review.